Unlike many other website providers, we understand all aspects of the technology discussion. We also understand how most content on your website starts out in your office systems. This could be anything from simple content creation in word right through to product categories and details in your operational systems. 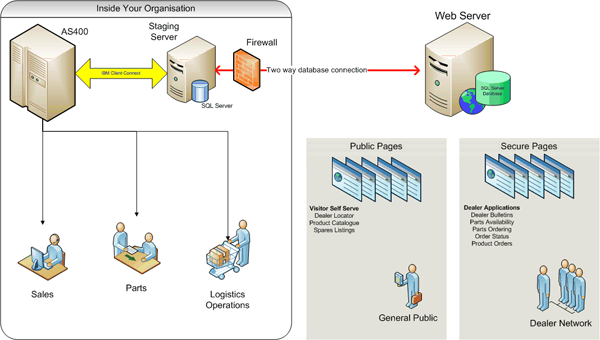 Sometimes it is as simple as a small database to cater for a business process. Whatever it is, we will have already built an integration method similar to your requirements. We have many clients already reaping the rewards of content generation from internal systems. This includes complex data requirements such as used car listing systems or full product and price catalogues being available as part of your web site. if you have some internal data that needs to populate your website, we will have a solution, guaranteed. Below is a recent project we created for a multinational to provide a range of options for both casual visitors and their dealer network. Data transfer from the AS400 populated the products and spare parts catalogue, whilst orders were transferred back to the internal systems for processing. The secure content areas allowed the dealer network to check the status of orders, invoices and deliveries.